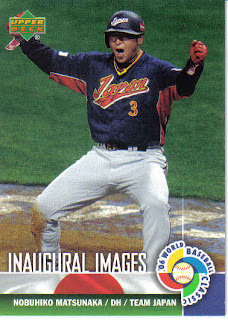 I'd just like to take this moment to say that the baseball card coverage of the WBC really sucked. There was a crummy 50 card box set from Upper Deck that did no team justice (and didn't even include Cuba), then a bunch of inserts for Upper Deck sets that would cost a fortune if they could all be tracked down. 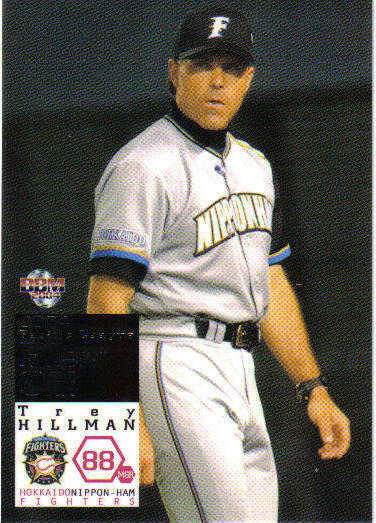 As far as I can tell, there were no Japanese sets at all, certainly not a cool team set like the 2003 BBM Japan National Team box set. Hoepfully, things will be better in 2009. But I'm not counting on it. 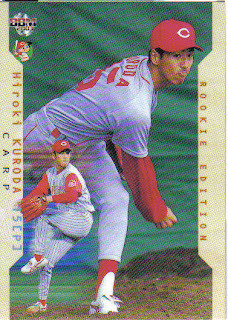 I'll try to get a post on Hiroki Kuroda up later this week. 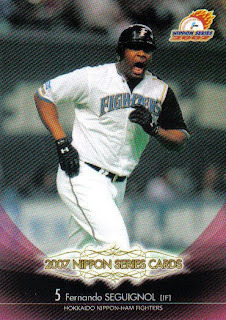 The 2007 BBM Nippon Series set is out. 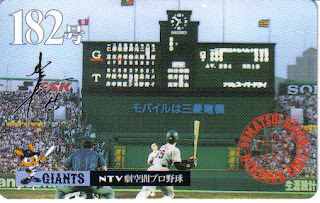 BBM produces an annual box set dedicated to the Nippon Series. 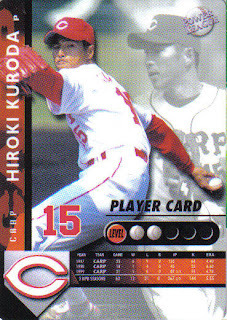 A typical set contains the cards for all the players for the two teams in the Series as well as their managers. 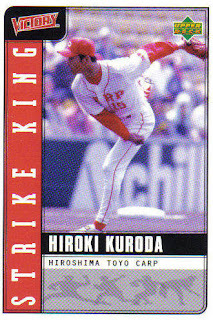 There's also cards commemorating the winners of the Series MVP award, the "Fighting Spirit" award (basically, the MVP of the losing team) and the "Outstanding Player" awards (three awards to highlight players who were outstanding (duh! ), but not quite MVPs. Typically they all come from the winning team, but occasionally a player from a losing team wins). 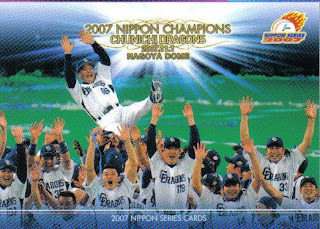 A final card commemorates the winning team. In older sets, this was a posed team photo of the winning team, but lately it's a picture of the winning team celebrating. 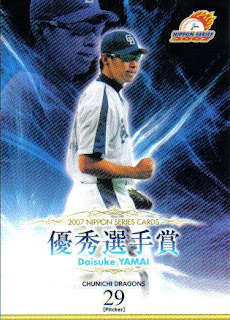 This year's set contains 64 cards - 28 cards for the Dragons, 30 cards for the Fighters, the MVP card for Norihiro Nakamura, the "Fighting Spirit" card for Yu Darvish, "Outstanding Player" cards for Daisuke Yamai (hmm, wonder what he did that was so outstanding), Masahiro Araki and Masahiko Morino plus the winning team card. 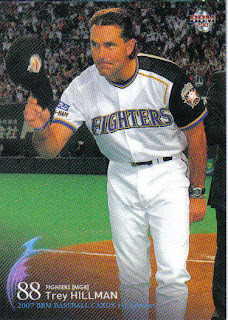 As always, the pictures used on the cards were all taken during the Series itself, so for example the card of Fernando Seguignol of the Fighters shows him reacting after hitting one of his two home runs in the Series and the card of Hitoki Iwase shows him with his arms raised up after getting the last three outs of the Series. While I'm talking about new stuff, I want to mention that BBM's web site has listings for this winter's nostalgic set ("Back To The 70's") and the Rookie Edition. 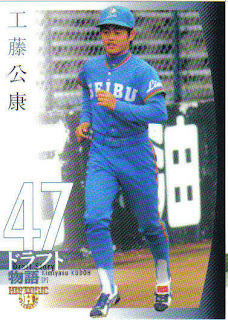 The "Back To The 70's" set may already be in stores in Japan, but I haven't seen it at Yakyu Shop yet. I think it contains cards of OB players from the 1970's as well as current players who were born in the 1970's. The Rookie Edition set contains cards of the players drafted in last month's draft. I believe that the set will actually be released in February. 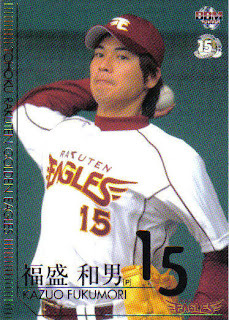 From top to bottom, that's his 2001 Konami Field Of 9 card (#34), his 2004 BBM 1st Version card (#66) and his 2005 BBM Tohuko Rakuten Golden Eagles Box Set card (#E07). 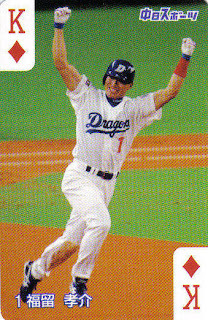 From top to bottom, that's his 1999 BBM Rookie card (#310), one of his 1999 Calbee rookie cards (#079), his 2003 Chunichi Sports Dragons Team Set card and his 2006 BBM Dragons' 70th Anniversary Set card (# 96). 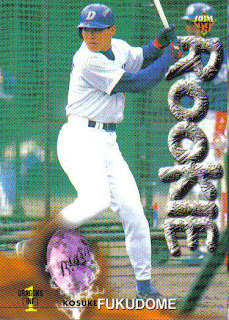 Kanebow put out sets in 1993 and 1994. 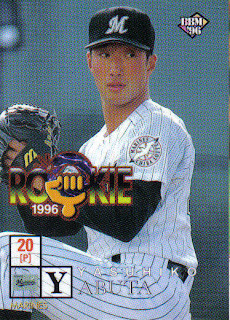 I've never seen a 1994 card, so I can't say much about it. 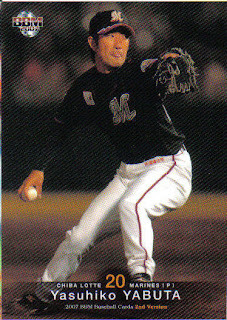 The 1993 cards were similar to the Action Packed cards in the US around the same time in that the player's image was raised on the card. 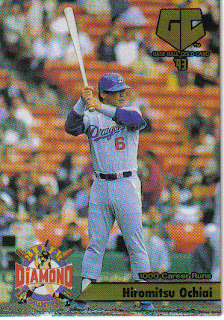 Deanna Rubin had a post a few weeks back that involved opening packs of Nostalgic Baseball and Draft Story cards (both BBM sets). Since these are two of my favorite sets from the past year or so, I thought I'd write up something about them. 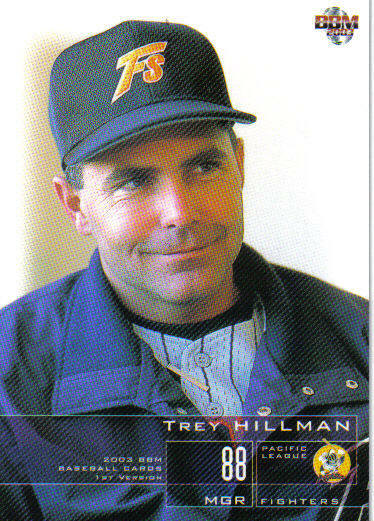 The Nostalgic Baseball set was released in the summer of 2006. 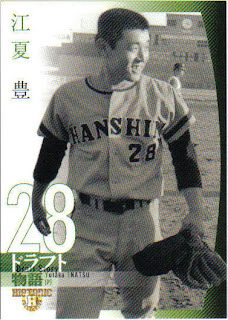 It contains 108 cards of players mostly from the 1930's - 1960's. What's really cool about the cards is that BBM colorized the pictures. 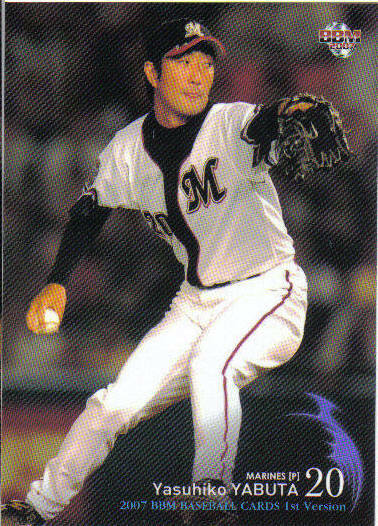 Some of these players have never had a card in color before (hell, some of them may never have had a card before). There are a great many Hall Of Famers in the set - Nagashima, Oh, Kawakami, Sawamura, Nomura, Harimoto, Starffin, Yonamine, Nishizawa, Inao, Nakanishi among them, along with guys like Akira Ohgi and Hiroshi Gondoh who are better known as recent managers. One of the other things that I find neat about the set is that they have some of the more obscure teams represented. 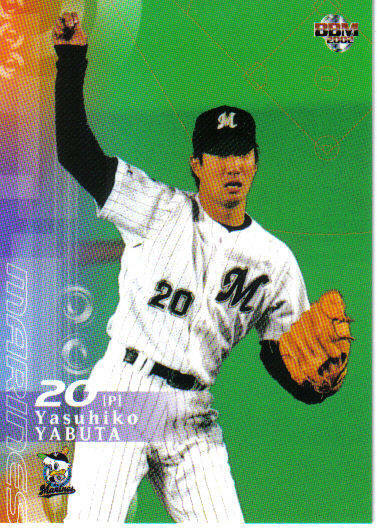 The decade or so following World War II saw a lot of name changes in NPB as companies bought and sold teams, the two league system came along and teams merged with each other. 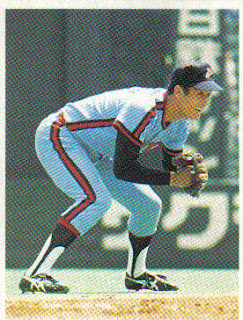 Teams like the Shochiku Robins, the Taiyo-Shochiku Robins (a merger of the Taiyo Whales and Shochiku Robins that only existed in 1953 and who are an ancestor of today's Baystars), the Tokyo Senators, the Nishitetsu Clippers (today's Seibu Lions), and the Kyuei Flyers (today's Fighters) all appear in the set. The Draft Story set was BBM's Historic set from last winter. 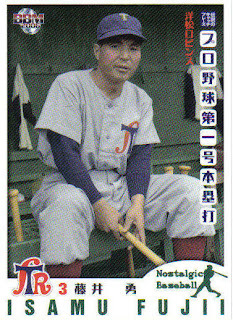 Like the other Historic sets, this set contains a mixture of retired (OB) players as well as current players. 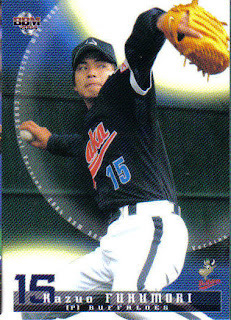 There are 144 cards in the set, 72 OB players and 72 current players. Each card shows the player essentially in his rookie year, with the team that drafted him. 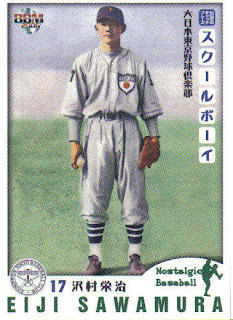 Since NPB didn't institute a draft until the mid-60's (like the US), players like Nagashima and Oh are not represented in the set. 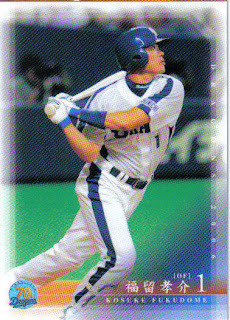 Ichiro Suzuki, Hideki Matsui and Kenji Johjima are in the set (as OB players), which I believe marks the first appearence of any US players in a BBM set while they played in the US. 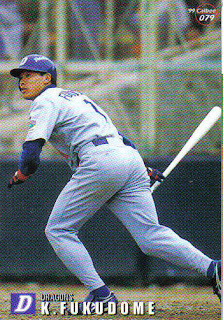 There are some interesting photos in the set - Deanna mentioned a young Michihiro Ogasawara wearing catching gear. 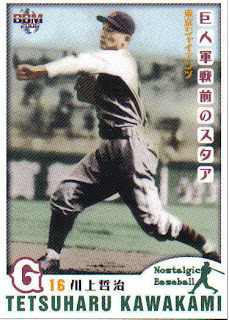 There's a similar picture of a young Akira Etoh. 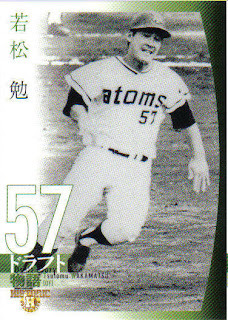 Like the Nostalgic Baseball set, there are some obscure teams represented like the Yakult Atoms. 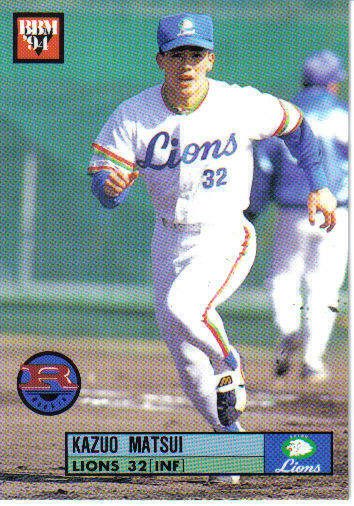 I hadn't realized that Osamu Higashio had been drafted by the Lions while they were owned by Nishitetsu. That means he played for the Lions for Nishitetsu, Taiheiyo, and Crown Lighter as well as Seibu. 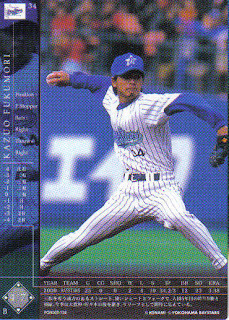 I think my favorite two cards are of current Baystars pitcher Kimiyasu Kudoh from 1982 and a very young and slender Yutaka Enatsu from 1967. From top to bottom, that his 2003 BBM 1st Version, 2004 BBM Pacific League Playoff and 2007 BBM 1st Version. 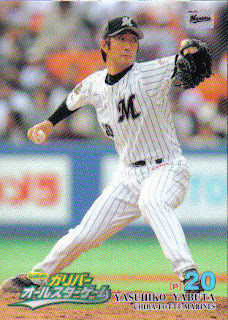 When I was trying to pick out some cards to post here, I discovered that it seems like BBM only has pictures of him throwing from left to right. 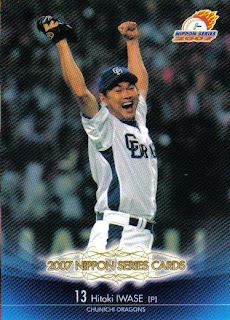 His 2006 BBM 1st and 2nd Version cards show him in similar poses, only with his arms in different positions. 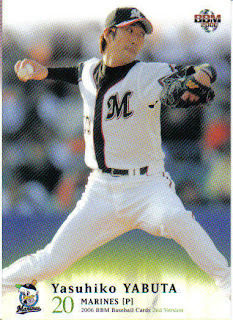 This trend continued with his 2007 BBM 1st and 2nd Versions as well as the All Star set. At least the uniform changed. 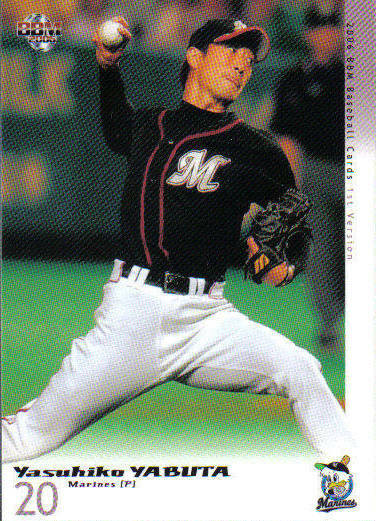 Seriously, I have something like 13 cards of his and all but his rookie card and this 2002 BBM 1st Version card show him in the middle of his motion, ball in hand, going from left to right. I've never noticed this with anyone else, but maybe I'll need to keep an eye on this now. 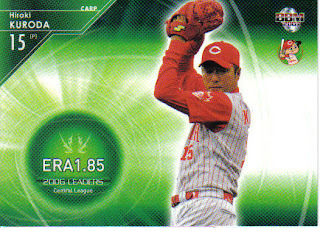 Update: I took a look at what was out there for Yabuta on eBay to see what cards I didn't have for him. Looks like this has been the default Yabuta pose for a lot of his cards. (The card on the far right of the middle row is his 2004 BBM Marines card. It's the same pose, but from a different angle.) However, his 2000 BBM card did not follow the pattern.